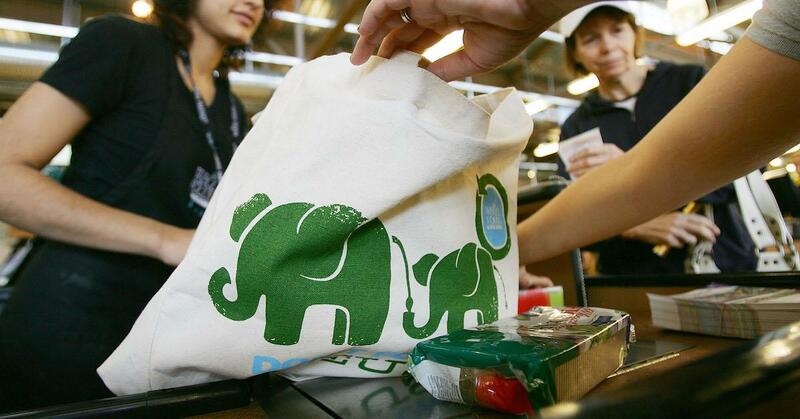 New Yorkers are about to have even more of an incentive to take reusable totes to the grocery store. As part of the New York State budget proposal, a bill banning plastic bags is expected to pass during its final round of legislation on Monday. Should the bill pass, starting in March 2020, stores across New York state will be banned from handing out single-use plastic shopping bags, the New York Times reported. New York would be joining California, the only other state with a statewide ban, and Hawaii, which has a ban in every county. Here's how the ban will work. Every store in New York state will be prohibited from providing single-use plastic carrier bags for customers. Instead, consumers will be encouraged to bring their own reusable tote bags. As the New York Times added, counties can elect to participate in a paper bag program, which would allow stores to offer paper bags for 5 cents each. That money would go towards a new trust to fund reusable bags for consumers in need, and the NYS Environmental Protection Fund. This doesn't mean you won't see people carrying plastic bags in New York anymore. According to the April 2018 version of the bill, as seen on Governor Andrew Cuomo's website, the ban has a slew of exemptions. For example: Restaurants will still be able to hand out plastic bags for takeout; grocery stores will still provide plastic bags in various locations, including the deli counter, the produce section, and the bulk section; dry cleaners can still wrap each item in a plastic garment bag; and stores can still sell boxes of trash bags and other plastic bags. The bill is sponsored by a group of New York lawmakers, including Governor Cuomo, who created the New York State Plastic Bag Task Force in March 2017. The task force has been working on a solution to the state's plastic bag problem for two years now, and the group's website noted that New York residents use a whopping 23 billion plastic bags annually. That's comes out to 1,177 plastic bags per New Yorker, per year. "For far too long these bags have blighted our environment and clogged our waterways and that's why I proposed a ban in this year's budget," Cuomo said in a statement, as per NBC News. "The blight of plastic bags takes a devastating toll on our streets, our water and our natural resources, and we need to take action to protect our environment," Governor Cuomo said in a press release to introduce the bill in 2018. "As the old proverb goes: 'We did not inherit the Earth, we are merely borrowing it from our children,' and with this action we are helping to leave a stronger, cleaner and greener New York for all." New York State Senator Todd Kaminsky, who is also chair of the State Senate's Environmental Conservation Committee, is a huge supporter of the bill. "I think we’re going to look back and wonder why this isn’t something that was commonplace before now," Kaminsky told NBC News. "But I’m glad we’re doing it now and leading the way in being one of the first states to do it." Whether or not you live in a place with a plastic bag ban, there are so many easy ways to start reducing your own consumption of single-use plastic bags. It's as simple as packing a reusable tote (for the grocery store as well as other shopping), reusable cotton bags or jars for the bulk section, and reusable produce bags for your fruits and veggies.